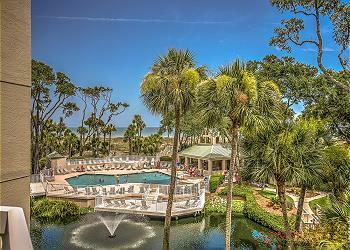 Located in beautiful Palmetto Dunes plantation, this cozy coastal 2-bedroom, villa is only steps away from the beach. The bright, open kitchen, dining room and living room are only bested by the amazing view off the balcony! One bedroom has a king bed with a charming slider that opens to the balcony. Twin beds are in the other room, and the living room sofa is a sleeper, so 6 can easily sleep comfortably! There are also 2 full bathrooms! This beachy villa is in a great spot for the perfect island getaway!